I have a confession to make. Not too long ago, I was the little girl at your doorstep. You know her. She was the shy little girl dressed in a uniform, hair braided down the sides, nervously clutching a sheet of paper. She looked up at you with big eyes and had an even bigger question to ask. I was a Girl Scout for many years and loved every minute of it. I sold cookies because it was a good fundraiser for the Girl Scouts. Buying a box of cookies from me would help send me to camp over the summer and pay for the activities I participated in, opening up a world of new opportunities. Or, at least this is what I told my cookie customers. More honestly, I just wanted to sell enough cookies to win a free giant stuffed duck. Somehow I don't think this pitch would have gone over as well. Hi! Buy cookies from me because I want a free duck! It doesn't quack, but its squishy and bigger than my head! Luckily, my pitch didn't matter because when it comes to selling Girl Scout cookies, I wouldn't even have to utter a word to sell a few boxes. No one can say no to these cookies. These cookies have been popular so long that by now everyone has their own favorite. My favorite happens to be the Samoas (those delicious chocolate caramel cookies), but the Thin Mints come in a close second. Because Girl Scout cookies are so loved this time of year, I thought I'd share something else you can do with them besides eating the entire box in one sitting (which has been known to accidentally happen). 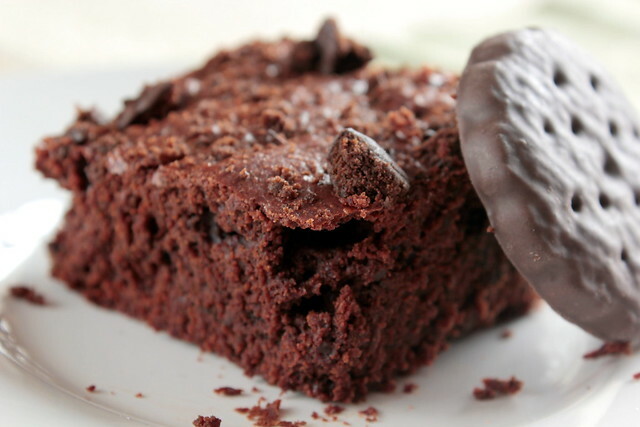 These Thin Mint brownies are just fun. 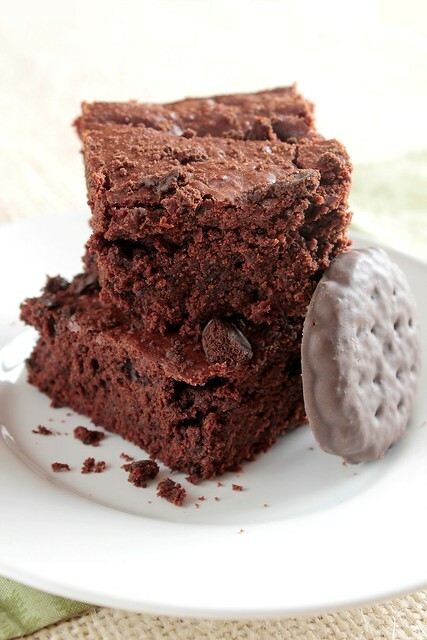 The brownies are fudgy and moist with an undeniable chocolate mint flavor. 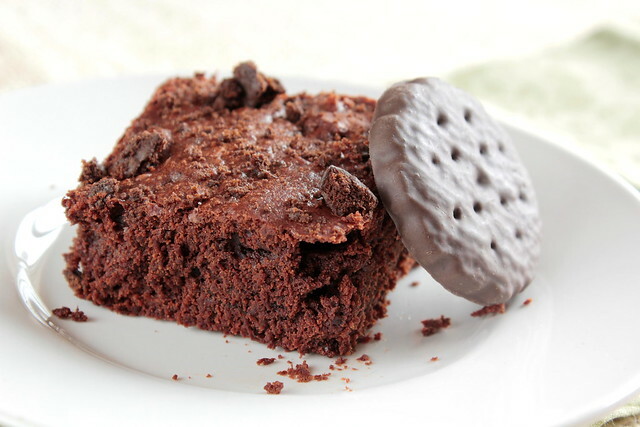 The Thin Mints are crushed and folded into the brownie batter to give the brownies that full Thin Mint flavor. The cookies may lose their crunch, but they certainly do not lose their characteristic taste. 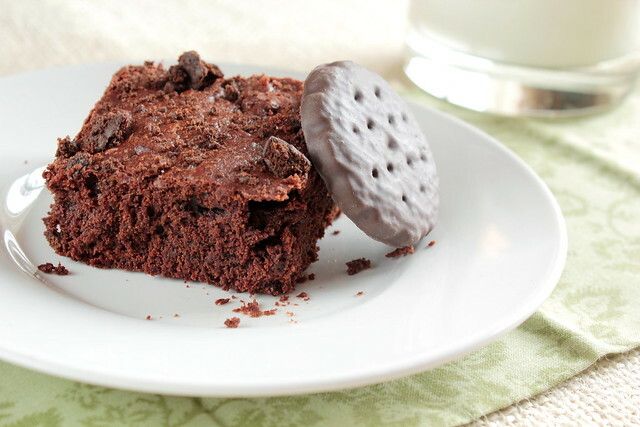 Make these if you have Girl Scout cookies laying around. Make them even if you don't—any chocolate mint cookie will do.